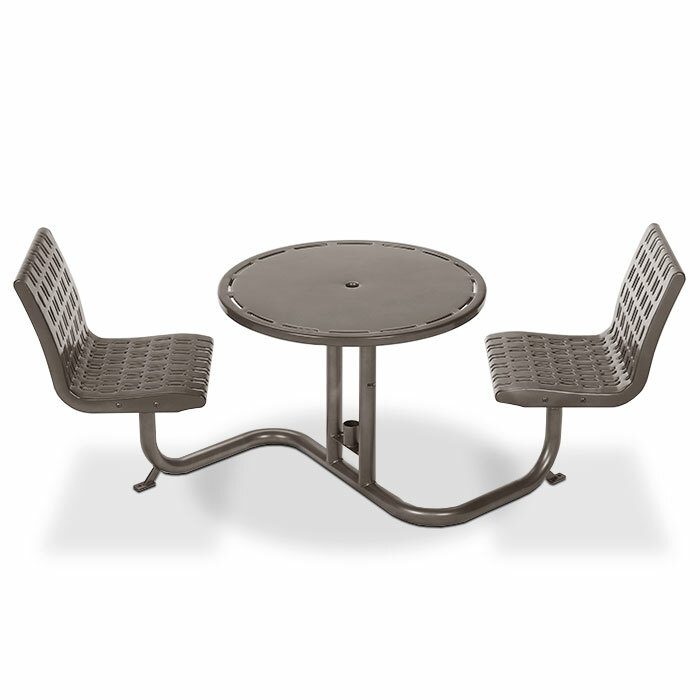 This Cosmopolitan Bistro Table with (2) Fixed Flat Seats offers sharp, sophisticated lines combined with an eye-catching perforated steel seat to create a beautiful table that is perfect for upscale bistros & cafes. The heavy-gauge, perforated steel seat & 36" diameter table top is protected by a thick plasticol infused, high-gloss powder coat finish that will not fade, crack, peel, mold or mildew. 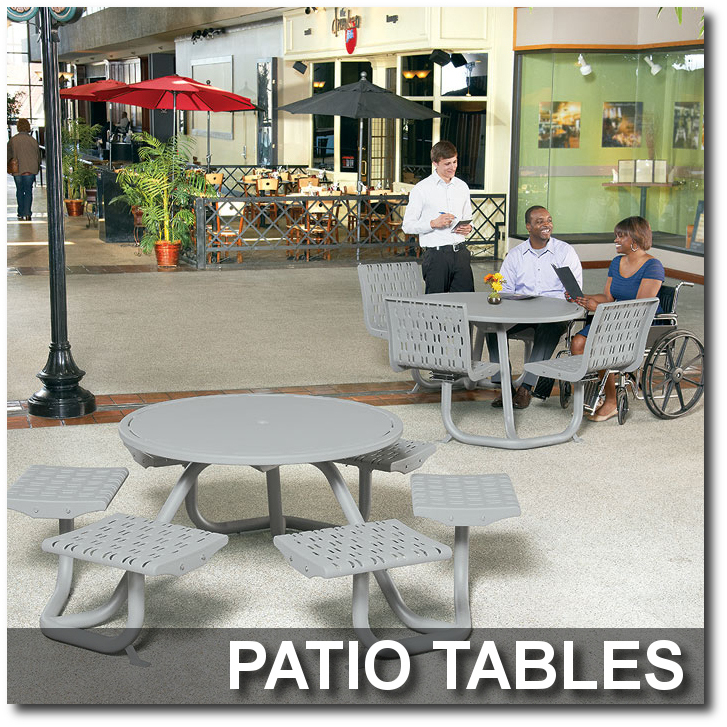 Plasticol also helps to keep surfaces cool in the summer and warm in the winter. Seats are attached to help maintain a neat dining arrangement. Pre-drilled holes in the base allows for easy surface mounting for permanent placement. This Cosmopolitan Bistro Table with (2) Fixed Contour Seats offers sharp, sophisticated lines combined with an eye-catching perforated steel seat to create a beautiful table that is perfect for upscale bistros & cafes. 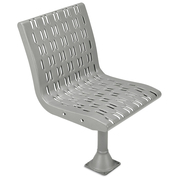 The heavy-gauge, perforated steel seat & 36" diameter table top is protected by a thick plasticol infused, high-gloss powder coat finish that will not fade, crack, peel, mold or mildew. Plasticol also helps to keep surfaces cool in the summer and warm in the winter. Seats are attached to help maintain a neat dining arrangement. 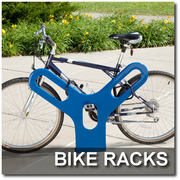 Pre-drilled holes in the base allows for easy surface mounting for permanent placement. This Cosmopolitan Bistro Table with (2) Swivel Contour Seats offers sharp, sophisticated lines combined with an eye-catching perforated steel seat to create a beautiful table that is perfect for upscale bistros & cafes. 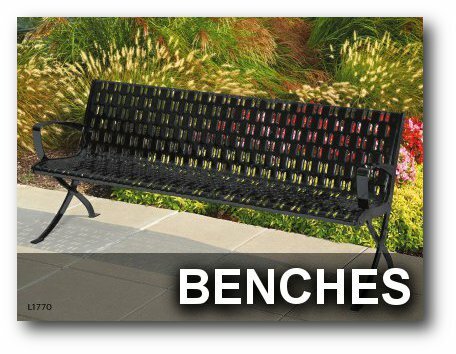 The heavy-gauge, perforated steel seat & 36" diameter table top is protected by a thick plasticol infused, high-gloss powder coat finish that will not fade, crack, peel, mold or mildew. Plasticol also helps to keep surfaces cool in the summer and warm in the winter. Seats are attached to help maintain a neat dining arrangement. 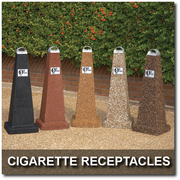 Pre-drilled holes in the base allows for easy surface mounting for permanent placement. 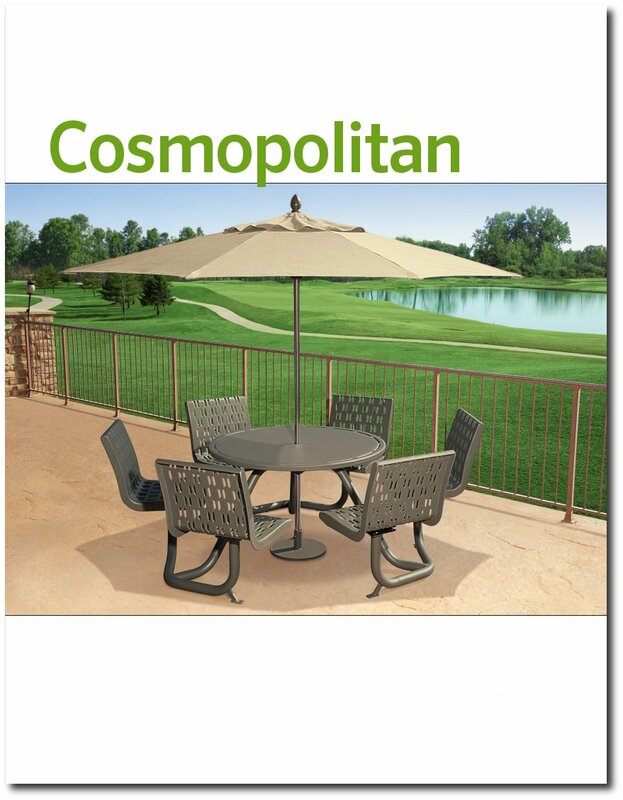 This Cosmopolitan Table with (4) Fixed Flat Seats offers sharp, sophisticated lines combined with an eye-catching perforated steel seat to create a beautiful table that is perfect for upscale bistros & cafes. 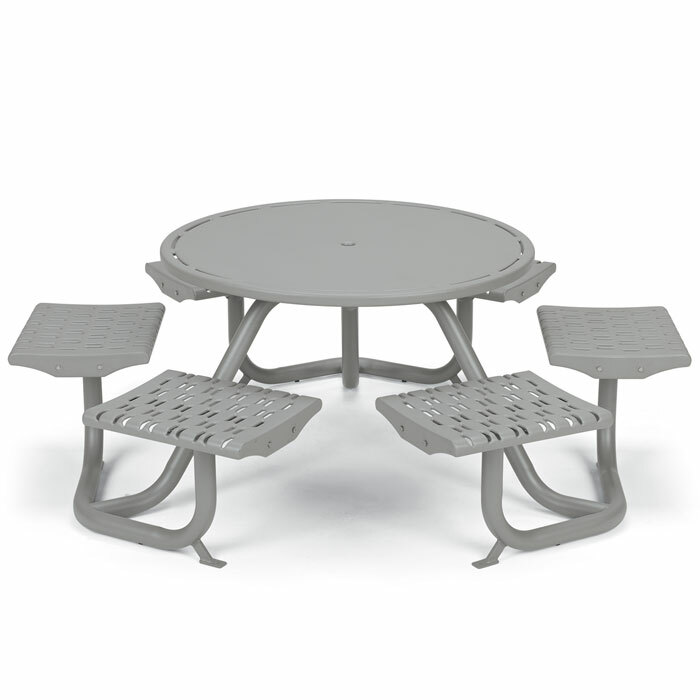 The heavy-gauge, perforated steel seat & 36" diameter table top is protected by a thick plasticol infused, high-gloss powder coat finish that will not fade, crack, peel, mold or mildew. Plasticol also helps to keep surfaces cool in the summer and warm in the winter. Seats are attached to help maintain a neat dining arrangement. 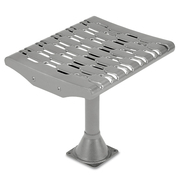 Pre-drilled holes in the base allows for easy surface mounting for permanent placement. 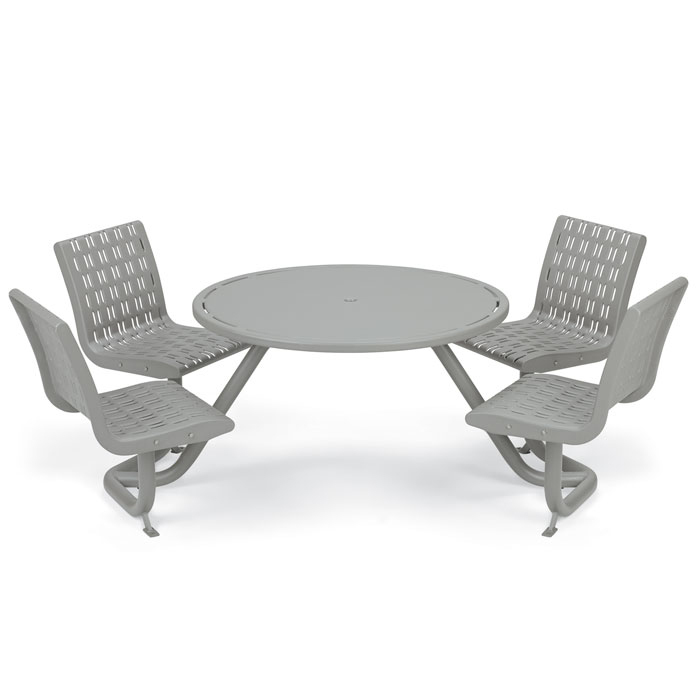 This Cosmopolitan Table with (4) Fixed Contour Seats offers sharp, sophisticated lines combined an eye-catching perforated steel seat to create a beautiful table that is perfect for upscale bistros & cafes. 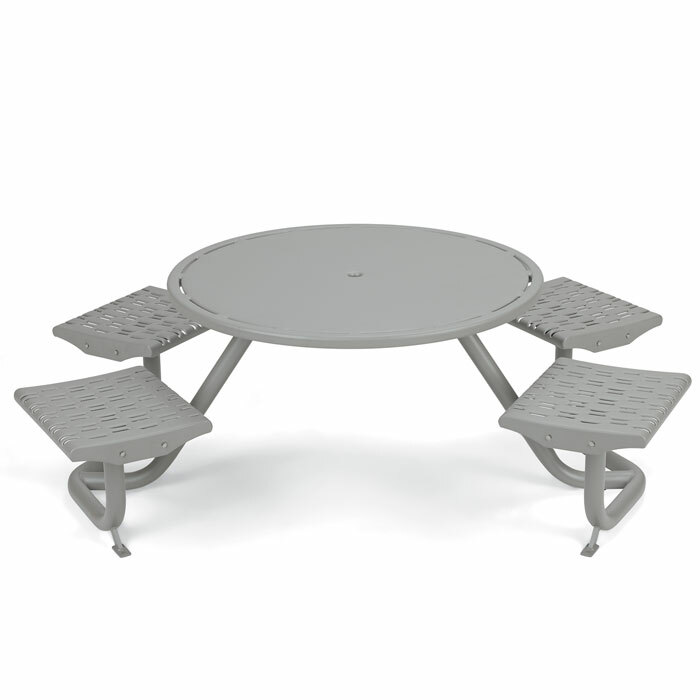 The heavy-gauge, perforated steel seat & 36" diameter table top is protected by a thick plasticol infused, high-gloss powder coat finish that will not fade, crack, peel, mold or mildew. Plasticol also helps to keep surfaces cool in the summer and warm in the winter. Seats are attached to help maintain a neat dining arrangement. Pre-drilled holes in the base allows for easy surface mounting for permanent placement. 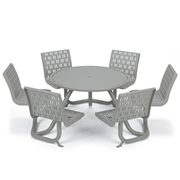 This Cosmopolitan Table with (4) Swivel Contour Seats offers sharp, sophisticated lines combined with an eye-catching perforated steel seat to create a beautiful table that is perfect for upscale bistros & cafes. 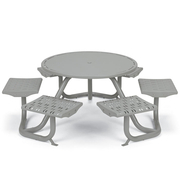 The heavy-gauge, perforated steel seat & 36" diameter table top is protected by a thick plasticol infused, high-gloss powder coat finish that will not fade, crack, peel, mold or mildew. Plasticol also helps to keep surfaces cool in the summer and warm in the winter. Seats are attached to help maintain a neat dining arrangement. Pre-drilled holes in the base allows for easy surface mounting for permanent placement. This Cosmopolitan Table with (6) Fixed Flat Seats offers sharp, sophisticated lines combined with an eye-catching perforated steel seat to create a beautiful table that is perfect for upscale bistros & cafes. 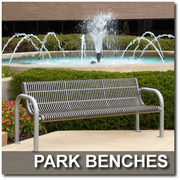 The heavy-gauge, perforated steel seat & 36" diameter table top is protected by a thick plasticol infused, high-gloss powder coat finish that will not fade, crack, peel, mold or mildew. Plasticol also helps to keep surfaces cool in the summer and warm in the winter. Seats are attached to help maintain a neat dining arrangement. 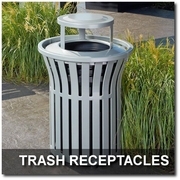 Pre-drilled holes in the base allows for easy surface mounting for permanent placement. 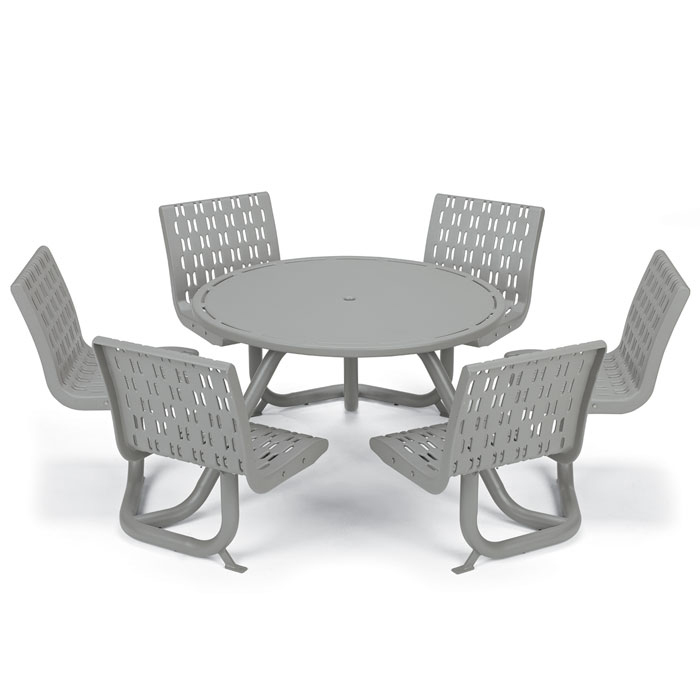 This Cosmopolitan Table with (6) Fixed Contour Seats offers sharp, sophisticated lines combined with an eye-catching perforated steel seat to create a beautiful table that is perfect for upscale bistros & cafes. 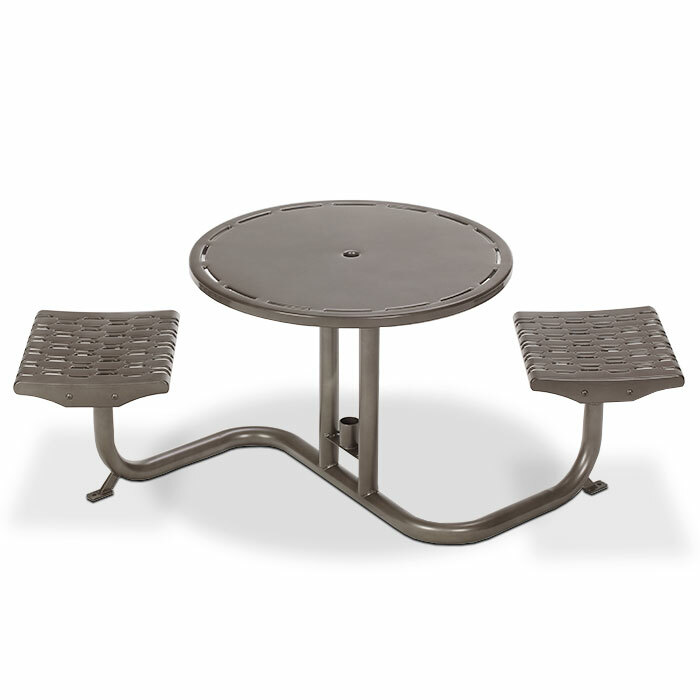 The heavy-gauge, perforated steel seat & 36" diameter table top is protected by a thick plasticol infused, high-gloss powder coat finish that will not fade, crack, peel, mold or mildew. 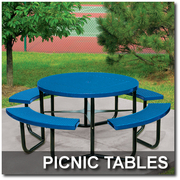 Plasticol also helps to keep surfaces cool in the summer and warm in the winter. Seats are attached to help maintain a neat dining arrangement. Pre-drilled holes in the base allows for easy surface mounting for permanent placement.